Significant numbers of accidents occur during adverse weather. The Hospital Episode Statistics for England show there were 7,031 admissions to hospital in 2012/13 as a result of people falling over on snow or ice some of which could have been prevented with a little preparation and forethought. The HSE’s latest statistics highlighted that there are 50% more trips and falls during the darker winter months with shorter daylight hours and harsh weather conditions as big contributing factors. This can lead to you and colleagues taking time off work, so potentially reduced working hours and more work to catch up on when you return to work. Slipping on ice is one of the biggest causes of accidents and could even lead to litigation. Ensure the workplace areas are well lit inside and outside. Ensure all pathways are cleared of leaves and are slip resistant. When frost, ice and snow occur ensure you have a procedure in place to stop icy surfaces forming and/or keep pedestrians off the slippery surface. Grit can be used, with effective signage and warning cones. For more detailed information read the HSE’s guide. 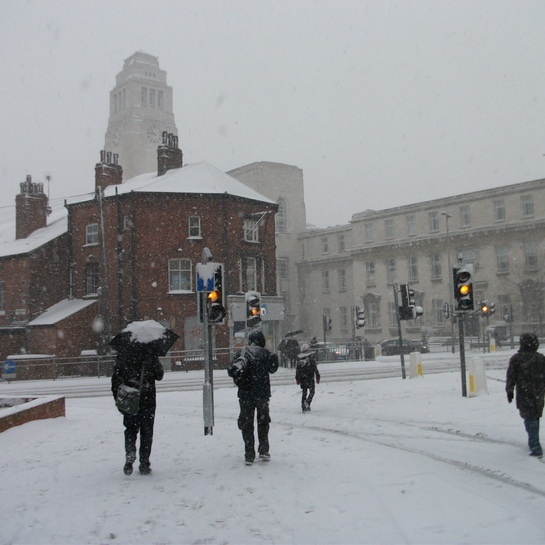 Policy: are you aware of the contents of your company’s Winter Risk Management Policy? Ensure you know all its details and you follow the guidance. Contacts: make sure you have a list of people in your phone or in a diary for example, so that you can let the relevant people know you are not coming in or are running late. Parking: consider where you will be parking and manage the risk accordingly; remember some side street may not be gritted. Clothing and Footwear: consider the weather forecast before you travel. If you have a car you can keep useful items such as warm clothes, food, water, boots, a torch and spade in it. However, if you are using public transport consider what clothing and footwear you may need for a return journey if the weather turns. Travelling: ensure your mobile is charged; you may wish to consider a small portable battery charger as a backup. Check you have enough fuel in your vehicle especially if you may get stuck on a road far from home. Ideally inform someone of your travel arrangements so if anything goes wrong, help should be able to get to you quicker. These are just some basic common sense approaches to adverse winter weather when you are out and about. Be aware that adverse weather increases the risks so be ready to manage it with knowledge and forethought. Reduce your winter weather risks! If you would like more information or advice on managing health and safety in your workplace, please visit our website.